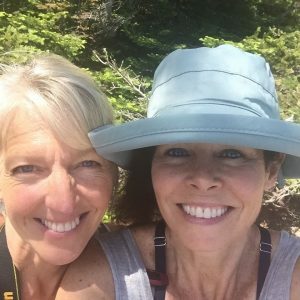 Last week I spent two days at Acadia National Park hiking with my friend, Melissa. We began our journey on the Ocean Path, a gorgeous trail that took us along the rocky coast of Maine. The smell of damp earth, balsam fir, seaweed, and ocean air was heavenly not to mention listening to the crashing waves, and birdsong as we walked and talked for hours. My sister Kerri invited me to attend a lecture at a local library called, “It’s Not About The Hike.” The presentation was delivered by Pat and Nancy, gals in their 50’s, who started walking on their neighborhood sidewalks and eventually climbed the 100 highest mountains in New England. I sat for over an hour, mesmerized by the slideshow and videos of their mountain climbing treks. They spoke about the healing that took place for each of them with every climb. They shared breath-taking photos that captured the majesty of nature. They talked about building their courage muscles by doing things like hiking in the pitch-black darkness. And they chronicled the warmth of their growing friendship. By the end of the night I felt so inspired I swear I would have climbed a mountain right then and there! The key to feeling fully alive lies in our willingness to try new experiences. Moving the body in bold, new ways has the power to transform a life. Aliveness happens when we stretch beyond our comfort zone. The kind of joy Pat and Nancy experienced didn’t come from playing it safe. We can do anything with the support of another human being. Just about anything. We need to spend time with people who challenge us. At the end of the evening, I was grateful to Kerri for the invitation and so glad I accepted. I need to remember to say yes to more spontaneous invitations. While Nancy and Pat are no longer giving talks, they did record their last presentation and it’s available on DVD. You can find it here. I hope they inspire you to challenge yourself in fun, new ways, and to spend more time surrounded by the beauty of the natural world. My love of hiking continues to this day because of them (and my sister-in-law, Missy, who’s trained me to hike safely). Which is why I ended up in Acadia. Missy’s guidance came in handy last week when Melissa and I found ourselves on the wrong trail and wound up needing to climb cliffs in order to reach the summit of a small mountain before sunset. Scary? Yes. But the exhilaration we felt when we reached the summit was worth every step. Join us for one of our little adventures. You can watch a video that Melissa took as we drove down Cadillac Mountain. You’d swear we were in the Ireland or the English countryside. In light of the horrific events unfolding in Orlando, Florida today, I’m sharing a video written and recorded by Paul Coleman, a psychologist and expert on dealing with grief and loss. You can watch it here.